Are you maximizing the power of your style routine? Get the most out of your heat styling tools & products for ultimate smoothness and long-lasting sleek. Sleek Prep is our first style primer that makes hair easier to style & gives you a better sleek! Applied before styling, it helps tame frizz, protect against heat up to 450 degrees, and block humidity. HOW DOES IT WORK? Featherweight primer formula with argan oil lightly conditions strands and works with any heat styling tool or other sleek products to maximize the smoothing power of your style routine. Not heavy, sticky or coating, it creates a humidity shield and blocks frizz for a long-lasting style. Remove lock from spray nozzle. Mist product from midshafts to ends section by section on damp hair. Layer on your usual smoothing products or begin heat styling. Rated 5 out of 5 by plim from SAD HERE IS MY DESPERATE ATTEMPT TO ASK YOU TO PLEASE BRING THIS PRODUCT BACK PLEASE PLEASE PLEASE. It's the only product in the world that instantly tamed my hair. It was magnificent, don't do this to us Garnier. Don't!!! i will buy a 50 pack if I have to. Rated 4 out of 5 by Me22 from Sad you discontinued the sleek primer it was great Why discontinue and then say the air dry product is the replacement? Not even close. Bring this back need a product that defrizzes and protects while I blow dry and flat iron. Rated 5 out of 5 by Rose English from WHY DISCONTINUED THIS GREAT PRODUCT?? This was the ONLY product which controlled my dry, brittle hair, which frizzed in the very humid (88%+) So. Florida weather. I have very fine, but dry hair and this was so light & slick - made & kept my hair smooth, soft & straight without a flat iron. The rest of your products are TOO STICKY, HEAVY & STIFF for my hair. They don't let my hair move naturally, and where my hair hits my shoulders, all these others make it set in that shape. PLEASE -- BRING IT BACK!!!! 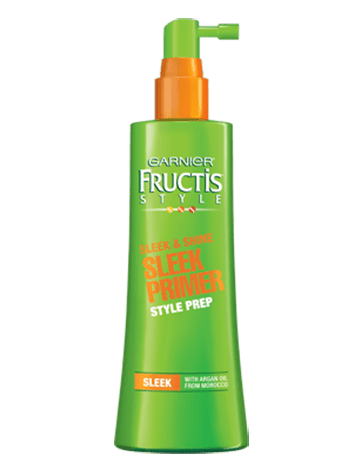 Rated 5 out of 5 by MarilynBadra from WHY I bought this from Big Lots and it was the ONLY product EVER to keep my hair silky straight all day frizz free the whole day! Not even their heat protectant helps! Bring this back please This was the only one! Rated 5 out of 5 by Lil Z from Love my hair!!! Just bought the product last week & am loving it already. Rated 5 out of 5 by michele601 from sleek & shine sleek primer style prep Finally found a product that works on my hair and it's discontinued. Why???? Rated 5 out of 5 by evaaaaa from THE BEST PRODUCT OOOMMMMGGGGGG!!! WHY ON EARTH DID Y'ALL DISCONTINUED THIS PRODUCT?!?! This IS by far the BEST product I've ever used!!!! PLEASE BRING IT BACK!!! Rated 5 out of 5 by Chey from Best product I love this product. By far my favorite product I have found so far. I am just extremely upset you discontinued this product. Please bring it back.